Prahlada was born to Hiranyakashipu and Kayadu. Hiranyakashipu was an evil king of Daityas who had been granted a boon that he could not be killed by any man or animal, at day or night, inside or outside. Hence Hiranyakashipu declared himself to be the God of the whole universe and proclaimed that there was no other God but himself, and ordered that all the worship should be offered to him. Prahlada was a great devotee of Lord Vishnu and despite of several warnings from his father Hiranyakashipu, Prahlada continued to worship Vishnu instead of him. His father then decided to commit filicide (killing ones own child) and poison Prahlada but he survived. He also attempted to trample this young boy with elephants, but Prahlada survived. Then he put him in a room with venomous snakes, and they made a bed for him with their bodies and provided him comfort instead. Holika, the sister of Hiranyakashipu, was blessed that she could not be hurt by fire. Hiranyakashipu finally put Prahlada on Holika’s lap as she sat on a pyre. Prahlada prayed to Lord Vishnu and Holika was burnt to death as Prahlada was unscathed. This event is still celebrated in India as the Hindu festival of Holi. When the king Hiranyakashipu found out Prahlada’s claim that the God Vishnu is present everywhere and in everything. He became furious and threatened the boy to kill him, and abused Vishnu in the worst language. But Prahlada still insisted that Vishnu was the Lord of the universe, with no Beginning and no End, the Omnipotent and the Omnipresent, and as such, he alone was to be worshipped. The king roared with anger and said: "You evil one, if your Vishnu is God omnipresent, why does he not reside in that pillar yonder?" Prahlada humbly submitted that He did do so. "If so," cried the king, "let him defend thee; I will kill thee with this sword." Thus saying the king rushed at him with sword in hand, and gave a terrible blow at the pillar. Instantly thundering voice was heard, and lo and behold, out of that pillar appeared Lord Vishnu in His awful Nrisimha form — half-lion and half-man! 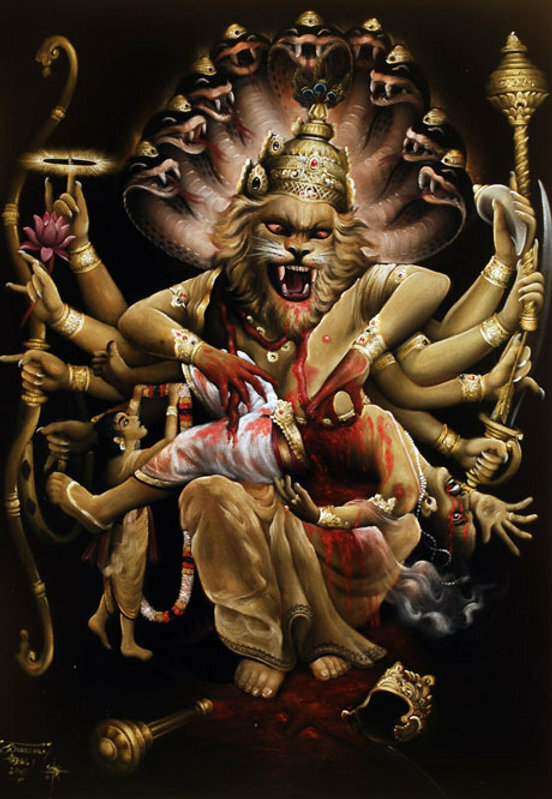 After tolerating abuse from Hiranyakashipu, Prahlada was eventually saved by Narasimha, who killed the king at the entrance to his home at dusk. Then the gods descended from heaven and offered hymns to Vishnu (Narasimha), and Prahlada also fell at His feet and broke forth into exquisite hymns of praise and devotion. Thus blessing Prahlada, the Lord Vishnu disappeared. Then the gods headed by Brahma installed Prahlada on the throne of the Daityas and returned to their respective spheres.